Use glob() to create a subsetted list of file names within a specified directory on your computer. Create a raster stack from a list of .tif files in Python. Plot various band combinations using a numpy array Python with matplotlib. In the previous lesson, you learned how to import a multi-band image into Python using the rasterio. You then plotted the data as a composite, RGB (and CIR) image using imshow() and calculated NDVI. In that case, all bands of the data were stored in a single .tif file. However, sometimes data are downloaded in individual bands rather than a single file. 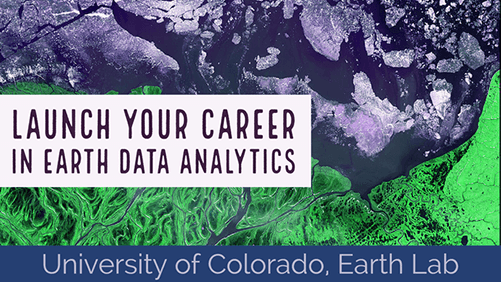 In this lesson you will learn how to work with Landsat data in Python. Each band in a landsat scene is often stored in an individual .tif file. Thus you will need to grab the bands that you want to work with and then bring them into a numpy array. Landsat data are spectral and collected using a platform mounted on a satellite in space that orbits the earth. The spectral bands and associated spatial resolution of the first 9 bands in the Landsat 8 sensor are listed below. More about the Landsat file naming convention. What satellite was used to collect the data. 20160723: representing the year, month and day that the data were collected. The second part of the file name above tells you more about when the data were last processed. You can read more about this naming convention using the link below. Learn more about Landsat 8 file naming conventions. As you work wtih these data, it is good to double check that you are working with the sensor (Landsat 8) and the time period that you intend. Having this information in the file name makes it easier to keep track of this as you process your data. Now that you understand the Landsat 8 Collection file naming conventions, you will bring the data into Python. To begin, load your libraries and set up your working directory. You will be working in the landsat-collect directory. Notice that the data in that directory are stored by individual band. Each file is a single geotiff (.tif) rather than one tif with all the bands which is what you worked with in the previous lesson with NAIP data. Why Are Landsat Bands Stored As Individual Files? The good news is that you already know how to work with .tif files in Python. You just need to learn how to batch process a series of .tif files to work with Landsat 8 Collections. Note that there is a crop directory. 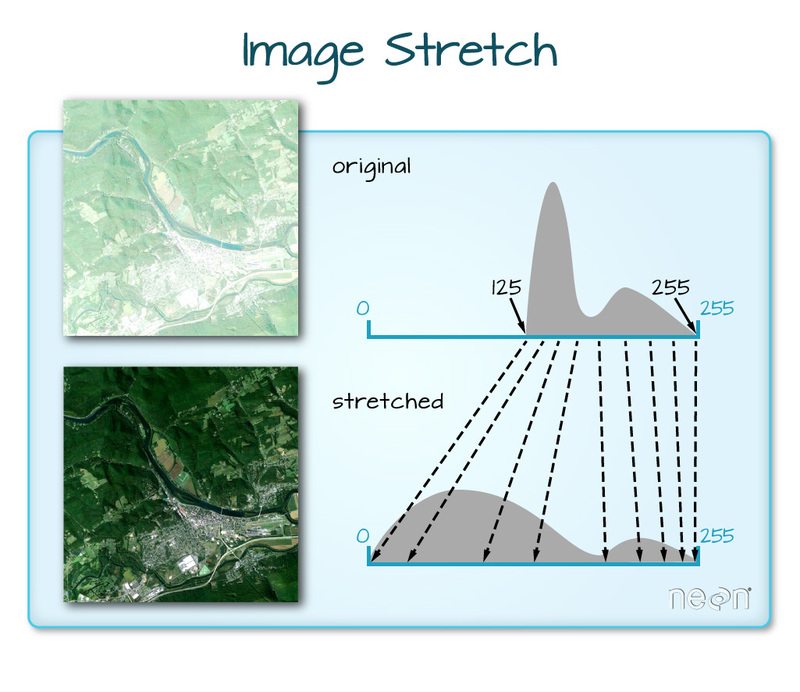 Landsat scenes are large. To make processing quicker for you as you learn, your instructor cropped the data to a smaller spatial extent. She also added the word _crop to the end of each file to ensure you know the data have been modified. Also, notice that some of the layers are quality assurance layers. Others have the word band in them. The layers with band in them are the reflectance data that you need to work with. You will generate a list of all files in the directory that contain the word band in the name. Loop through those layers to create a numpy array. You will use the glob function and library to do this in Python. Note that it is important that the file ends with .tif. So we use an asterisk at the end of the path to tell Python to only grab files that end with .tif. path/*.tif will grab all files in the crop directory that end with the .tif extension. To only grab files containing the word band AND that end with .tif we use *band*.tif. This tells python to look for the word band anywhere before the .tif extension AND anywhere within the file name. Be sure that your bands are in order starting at 1 and ending at 7! If the data are not in order, you can use the .sort() list method to sort your list alphabetically. The data in this lesson are sorted properly; however, we have noticed that this sort doesn’t happen by default on some machines. The code below will sort your list. Now you have a list of all of the landsat bands in your landsat collections folder. You could chose to open each file individually using the rio.open (rasterio library) function. Remember that Python uses 0 based indexing so band 3 is actually at index  not . Landsat band 4 - red band - plot. Note that this stack function was written into the Earth Lab earthpy python package to avoid all of the steps that you would have to take to create the stack. In the next lesson we will break down how this function works in case you want to know. Once you have stacked your data, you can import it and work with it as you need to! Plot showing all 7 of the landsat 8 bands for the Cold Springs Fire Site. Do you notice any difference in brightness between the bands?. Just like you did with NAIP data, you can plot 3 band color composite images with Landsat too. Below you will plot an RGB image using landsat. Refer to the landsat bands in the table at the top of this page to figure out the red, green and blue bands. Or read the ESRI landsat 8 band combinations post. Landsat 8 3 band color RGB composite. Notice that the image above looks dark. You can stretch the image as you did with the NAIP data, too. Below you use the stretch argument built into the earthpy plot_rgb() function. The str_clip argument allows you to specify how much of the tails of the data that you want to clip off. The larger the number, the most the data will be stretched or brightened. When the range of pixel brightness values is closer to 0, a darker image is rendered by default. You can stretch the values to extend to the full 0-255 range of potential values to increase the visual contrast of the image. When the range of pixel brightness values is closer to 255, a lighter image is rendered by default. You can stretch the values to extend to the full 0-255 range of potential values to increase the visual contrast of the image. Landsat 3 band RGB color composite with stretch applied. Landsat 3 band RGB color composite with stretch and more clip applied. You can create a histogram to view the distribution of pixel values in the rgb bands plotted above. Landsat 8 histogram for each band. Now you’ve created a red, green blue color composite image. Remember red green and blue are colors that your eye can see. 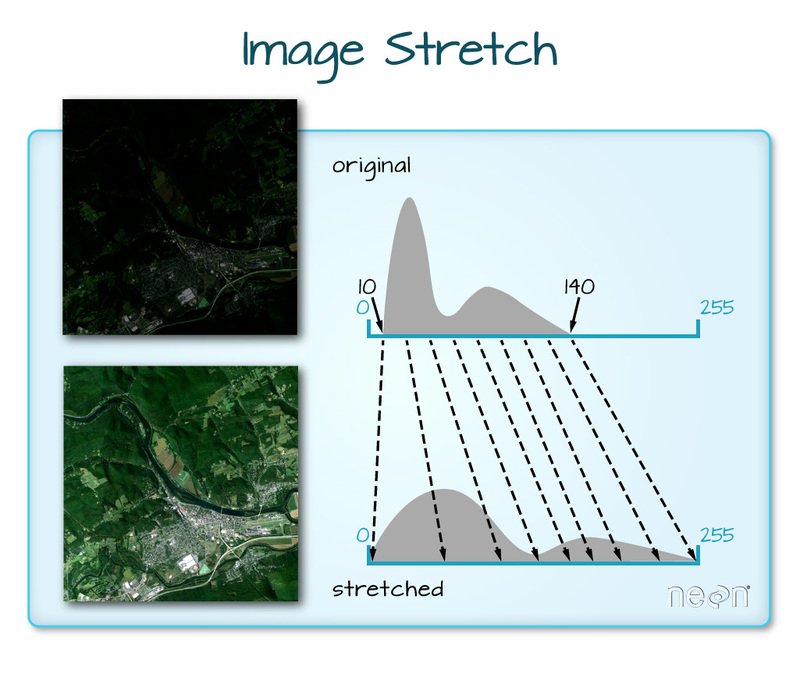 Next, create a color infrared image (CIR) using landsat bands: 4,3,2. Landsat 8 CIR color composite image. If you are working with Landsat data downloaded pre USGS collections, your data may be formatted and named slightly differently than the example shown on this page. Below is an explanation of the legacy Landsat 8 naming convention.